The recommendations are: 1. Organisational Pattern of Secondary Education 2. Organisation of Secondary School Curriculum 3. Text Books 4. Methods of Teaching 5. Discipline 6. Moral and Religious Education 7. Guidance and Counselling 8. Supervision and Inspection. Secondary education should be of 7 years. It should be for children of 11 to 17 years. It suggested to end intermediate college and merge class 11 with secondary schools and class 12 with B.A. Commission divided secondary education into two parts. Degree course should be of three years. One year Pre-university course for high school students to enter in university. Students who passed Pre-University should be allowed to enter in professional courses. Multipurpose schools should be established to take care of various abilities of students. Technical education-large number of schools should be opened along with Central Technical Institutions. Such institutions should be opened near factories so that so that students can take practical trainings. Industrial education cess should be levied on industries to finance technical education. Public schools should be reconstructed as secondary schools after 5 years. The boys and girls should be provided same education through co-education but there should be provision of home science teaching for girls. Girls’ schools should be opened in the areas where required. It should be such that it can train the students for work and leisure both. Productive works should be importance. It should include practical knowledge along with theoretical knowledge. Junior High School – Languages, Social Study, General Science, Mathematics, Art & Craft, Music, Physical Education. Secondary Education – Diversification of course has been done. There are some core subjects like Hindi, Social Science, Math and one craft which every student has to study. Along with it there are some optional subjects classified in seven groups like Humanities, Science, Technical subjects, Commerce, Agriculture, Fine Arts and Home Science. Hindi has been taken as the national language. For government services Hindi is compulsory. English is compulsory for secondary level. Sanskrit is also included as a third language which is optional. The medium of instruction should be mother tongue or regional languages. Along with the mother tongue and regional languages, national language and a foreign language should also be taught. Textbooks should be selected very carefully. There should be a committee for selection and reforms. There should be a definite standard for printing, cover and front page of the book. There should be no such book which spread hatred, enemity against any community, religion or social customs. There should be more than one textbooks for a subject. 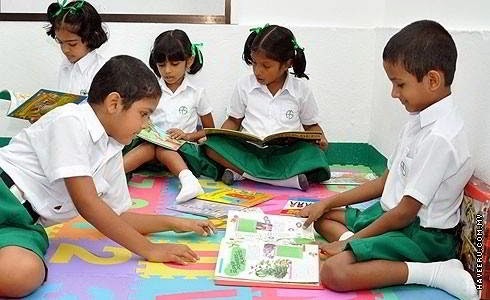 Teaching method should be adopted according to the need of moral, social and mental development of students. Teaching method should be activity based. It should not stress on verbalism and memorisation. Various types of expression works should be included in each subject. Teaching method should be adopted in such a way that it takes care of individual difference. There should be more stress on experimental and demonstration method. Libraries should be given a form of an intellectual laboratory. And it should help in completing personal and group works, literary interests and co-curricular activities. Libraries should be made the most attractive place for students. The books and magazines should be according to need and interest of the teachers and students. There should be a trained librarian in the libraries. Libraries should be open during the vacations as well so that students and society can benefit from them. School is a small society and the values, outlook, actions of students are important from the point of view of national importance. So, they should be trained accordingly. There should be close relationship between the teachers and students for best discipline. There should be self-government in the school run by House System, Prefects, Monitors and Student Council should be given important place. Co-curricular activities should be encouraged and extra-curricular activities should be also included in school education. NCC, Scout camps should be encouraged. First aid and junior red-cross work should be encouraged. Code of conduct for students should be made and maintained. There should be appointment of Guidance officers and career masters in the schools for educational, personal and vocational guidance. There should be arrangement of film shows, excursions related to various industries.